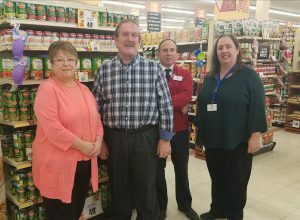 From left to right: Amy Roland, director of OCO Nutrition Services; James Karasek, Oswego County Legislator; Jim Monohan, Fulton TOPS Store Manager; and Mary-Margaret Pekow, executive director of Catholic Charities. FULTON, NY – Oswego County legislator representing the 22nd District, James Karasek organized a non-perishable food drive to benefit local agencies in dispersing food for those in need around the holidays. The Fulton TOPS store, 909 W. First St., is now home to a donation bin for customers to place purchased canned goods and non-perishable food items through the end of December. All collected food will be evenly distributed among Catholic Charities of Oswego County and Oswego County Opportunities’ Nutrition Services to be given to local families in need. 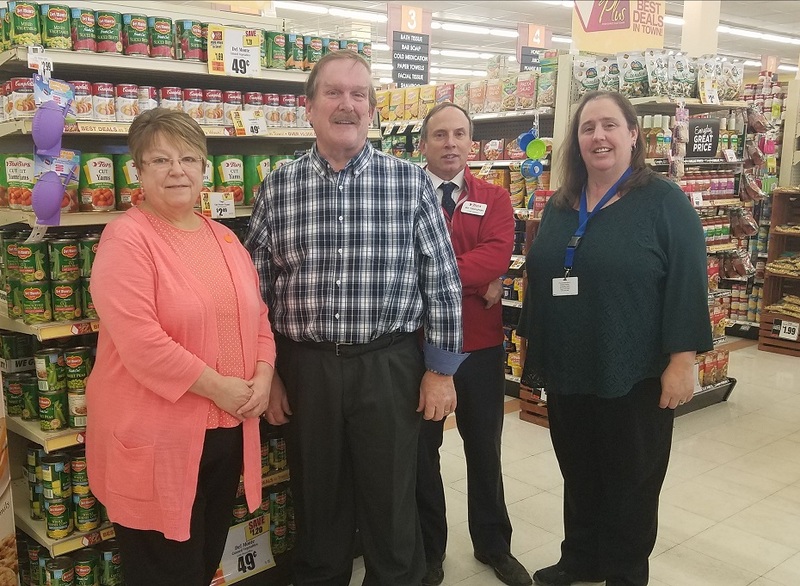 From left: Amy Roland, director of OCO Nutrition Services; James Karasek, Oswego County Legislator; Jim Monohan, Fulton TOPS Store Manager; and Mary-Margaret Pekow, executive director of Catholic Charities. “I started this three years ago because I know a lot of people who utilize Catholic Charities and the food they are able to provide, especially around the holidays. I was hoping to help take some pressure off knowing they need a lot of canned goods to fulfill their mission,” Karasek said. After a very successful first year, Karasek brought in OCO to receive half of the donations to benefit the local Meals on Wheels Program. “I had heard how, in instances where recipients are snowed in, or unable to get anything during a particular time, the Meals on Wheels drivers will carry extra non-perishable items to leave so they have something, anything to get through,” Karasek explained. So, for the second year and now in its third year, the can drive will benefit both Catholic Charities and OCO’s Meals on Wheels. Catholic Charities will use much of the donated goods for Christmas food bags, said executive director Mary-Margaret Pekow. The food bags are more than one holiday meal, however, as Catholic Charities works to put together bags that will sustain a household for several days while children are home from school and family is together during the holidays. Currently more than 300 local families and individuals have signed up to receive a Christmas food bag, with more signing up everyday. “This is great because anything we can get helps and the best part, it shows how great this community is,” Pekow said. OCO will use much of the donated items for the Meals on Wheels program that serves meals five days a week to roughly 500 homes of seniors and disabled people, said Amy Roland, director of OCO Nutrition Services. Meals on Wheels drivers interact with the recipients of the program and are able to identify families or individuals that are in desperate need with a very limited income, struggling to get through weekends of holidays. In these instances, drivers carry extra non-perishables to ensure that these people can get through to the next Meals on Wheels delivery. “We really depend on the good graces of the community and things like this can drive at TOPS because we are dependent on donations,” Roland said. TOPS store manager, Jim Monohan said the can drive is right in line with the goal of TOPS to end hunger. TOPS is also participating in the Bags of Hope program in which customers can buy a bag which in turn helps provide food to be sent from the TOPS warehouse to local agencies and food pantries. “The community really comes together this time of year, people really want to donate,” Monohan said. Examples of non-perishable food items that are high demand include protein food sources that are shelf stable such as peanut butter or tuna fish. People often donate cake mixes for desserts or candy to allow children a treat. Any canned goods and non-perishable food items will be accepted. James and his wife, Patricia Karasek kicked off the can drive with a donation of 120 canned goods. Any food that does not get used throughout the holiday season will be utilized in food pantries at both Catholic Charities and OCO Nutrition Services. Anyone in need of help or food this holiday season can contact Catholic Charities at (315) 598-3980 or stop in at 808 W. Broadway in Fulton as well as Oswego County Opportunities at (315) 598-4717 or stop in at 239 Oneida St. in Fulton. “We always figure out how to help anyone who comes to us, even if it means we lean on each other to find a solution,” Pekow said. Now, now now. Let’s keep the intention focused on nutrition, not treats containing The Destructive Triad of sugar, fat, or salt.